Tom Peters thinks that you can turn you "dept." --be it the HR "dept." or the payroll "dept." --into a professional service firm with the same level of creativity and commitment of the firms we always seem to hear about--McKinsey & Co., Chiat/Day, and Kleiner Perkins Caufield & Byers. 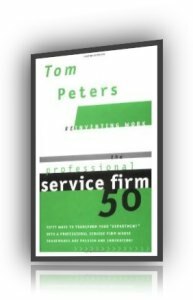 In The Professional Service Firm50, Peters spells out 50 ways to transform your "dept." into a client-centered, passionate organization. His advice ranges from "Bring in wild and woolly outsiders. E-x-p-a-n-d the box" (no. 27) and "A rabid scheduler is a must!" (no. 32) to "Become a Research & Development evangelist" (no. 35) and "Provide 'project management-leadership' opportunities" (no. 45). I. PSF = Inc. + clients + projects! 9a. Words . . . Matter. E.G. : "Engagement." 13. Measure: Did We Make An Impact? 14. Tom's Epithet No. 1: "Thoroughly Professional But Not Provocative." 19. Speaking of Accounting … Remember The Bottom Line: "Business—ing"
20. Got Any Quirky Projects On The List? 22. Pitch In … Bail Out! 23. PSFs Need Vision Statements! 24a. Cohabit With The Client! 24b. Turn The Client Into An Expert! 28. Create A "Sense Of Urgency"/" Excitement"/"Vibrancy"/"Buzz." 30b. You Need A Clown! 31. Love Thy "Support Staff." 32. A Rabid Scheduler Is A Must! 32a. We're In This For The Money! 40. Cherish Instability! Mix Up Teams! 40a. Mix Redux: Encourage Turnover! 42. Champion Passion. Champion Perfection. 43. Create Stories/Mythology Around "Project Winners." 47. Geeks—The Antisocial, Masterful Diggers—Of—Obscure—Facts—Should Be Adored! 49. Think … Dream … Act: WOW! Beauty! Impact! Distinction! 50. We Own This Place!